Fasteners utilizes underground storm water storage to optimize useful building and parking space in the commercial area of East Wenatchee. This innovative type of storm water management allows areas that would otherwise be set aside for storm water retention ponds to be used for more valuable retail, office and parking space. Our engineers designed parking lot, planter, and necessary adjacent public street and sidewalk improvements. In addition, we designed retaining walls to set the building gracefully in amongst the neighboring commercial properties, and utility connections for sanitary sewer, fire suppression, and water service needed to enable the building to house medical or dental office space. Boundary, topography and construction staking was done by our survey crews. The People's Bank project features the first pervious concrete storm water management project in north central Washington. This feature retains all storm water on the property and out of Wenatchee's municipal storm drain system. The project involved converting a car dealership showroom and car lot into a banking facility with drive through capability. We created new entrances to two adjacent arterial streets and provided all the construction staking for the project to provide a seamless interface with the engineering design. The pre-construction ALTA survey and topography survey were completed by our survey crews. This project is a finalist for the Washington Aggregates & Concrete Association "Excellence in Concrete" award. Munson Engineers provided Land Surveying services to aid in the design of the Highway 97 at Ruby Creek erosion control project. Flooding conditions during the winter and spring thaws had rearranged the landscape and compromised the integrity of highway 97 due to erosion and slides. 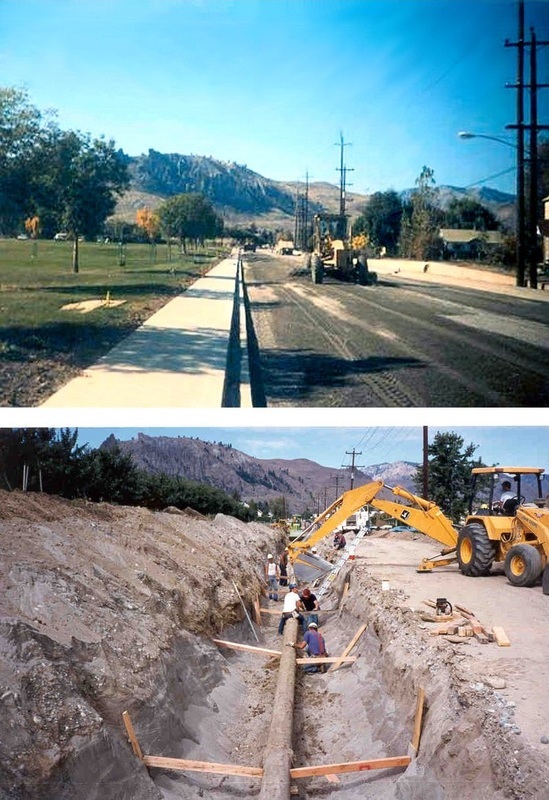 A partnership consisting of the City of Wenatchee, Chelan County and Asamara Minerals, a private corporation, selected Munson Engineers to upgrade Crawford Avenue in Wenatchee to arterial standards. The road structure needed to support frequent heavily laden gold ore trucks traveling between the gold mine and the Burlington Northern loading facility at Appleyard, which we also designed. 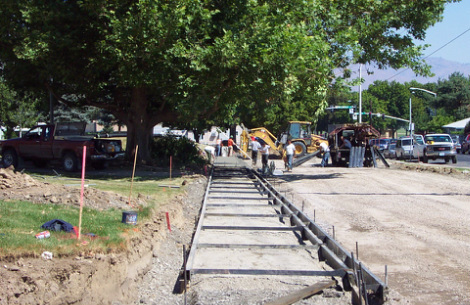 The project required our design of the removal and replacement of the head works of a major irrigation canal. We specified the method to lower a water distribution pipeline. This pipeline remained charged and active the entire time to maintain water service to residents. We designed a portion of the street to cross a sanitary landfill that formed Lincoln Park so that the street would not collapse due to decomposing garbage underneath. The street remains one of Wenatchee's finest classic streets due to appearance and amenities created by Munson. The Sandcastle Estates subdivision, planned, surveyed and designed by Munson Engineers, overlooks Moses Lake between the cities of Moses Lake and Othello. It features modern lifestyle amenities near a neighborhood park. We designed the lot layout, water distribution system, streets, storm water management systems, and electrical power distribution. 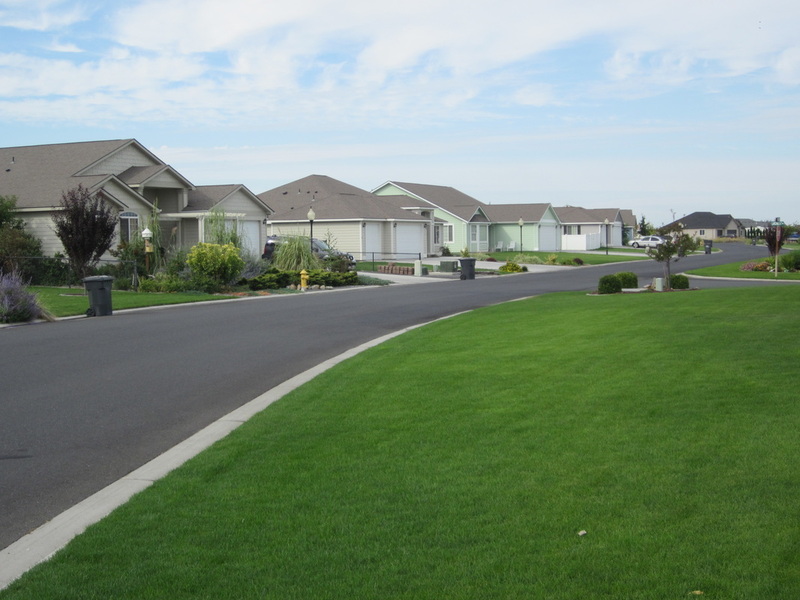 It is one of many neighborhoods we have designed in western and eastern Washington and northern Idaho. Munson Engineers successfully applied for a Community Development Block Grant to completely rebuild the failing water system of the town of Wilson Creek. The system needed a new well and pump house, a new transmission main, a new water distribution system throughout the entire town that brought needed fire suppression flow, and two new concrete standpipes for water storage, replacing an old ground level surface water reservoir. Munson Engineers prepared a hydraulic model for the entire community to use as the basis of its design and administered the grant requirements through the application, design, construction and closeout phases. The Fred Meyer East Wenatchee Retail Store was a waterfront development along the Columbia River. We brought to north central Washington the first mechanically stabilized earth retaining wall design, which enabled Fred Meyer to optimize it's building and parking space, and comply with the stringent requirements of the Washington State Departments of Fish and Wildlife and of Ecology, concerned over listed species of Columbia River fish. We suggested the store face the river rather than the more traditional street frontage to create better visual exposure. At that time, all previous Fred Meyer stores had been built to face the street frontage. We were responsible for surveying, site assessment, environmental checklist, coordination with State and local agencies, design and specifications, and weekly meetings with the contractors' and owner's representatives during construction. The opening date was set prior to application, and the Fred Meyer East Wenatchee Retail Store opened on that date. The Wenatchee High School Parking Lot originally had a bus ramp in front of the school. On the other side of the bus ramp were several sets of stairs to a lower level set up for automobile parking. We designed a new bus ramp along the side of the building where there was minor pedestrian and vehicular traffic, and reconfigured the parking lot to a shallow slope from the adjacent street to the front of the building, encompassing the location of the former bus ramp as an additional student parking area. Stairs were eliminated and handicap accessible walkways were installed. The project retained mature shade trees and added parking lot planters for traffic control and enhanced appeal. The FedEx Ground Facility at Baker Flats had specific requirements for grades and spot elevations, as well as security, to be imposed on the site chosen for development. The site was located at the base of a hill requiring setback standards to be met, and fronted an industrial road that was somewhat lower than the building pad proposed. The facility produced industrial wastewater generated by the cleaning of delivery trucks. We fit the building to the site so that all of the grade requirements were met, designed facilities for domestic wastewater treatment, industrial wastewater treatment, and stormwater management. We designed the loading docks, paving apron, and parking lot on the site in accordance with the FedEx standard plan and engineering and surveying requirements. 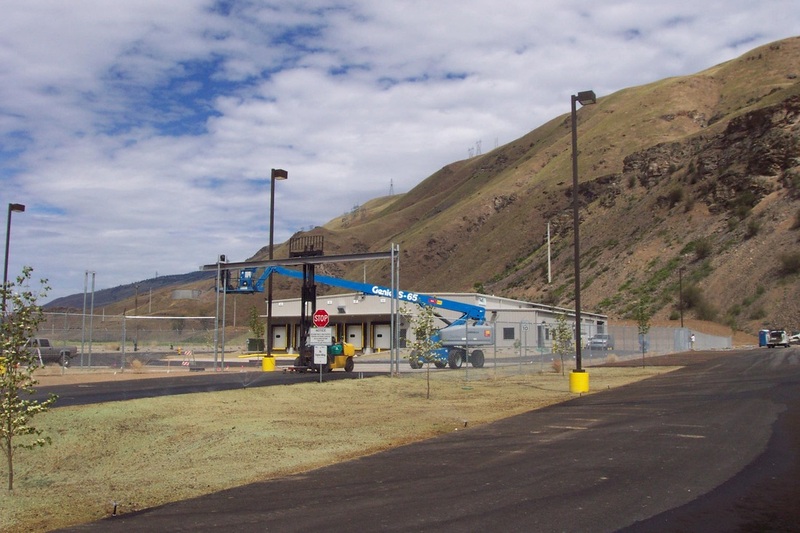 Construction drawings and field staking for Wenatchee's newest park were provided by Munson Engineers. The park features a disc golf course, playing fields, a picnic shelter and restrooms, flag plaza and sports courts. 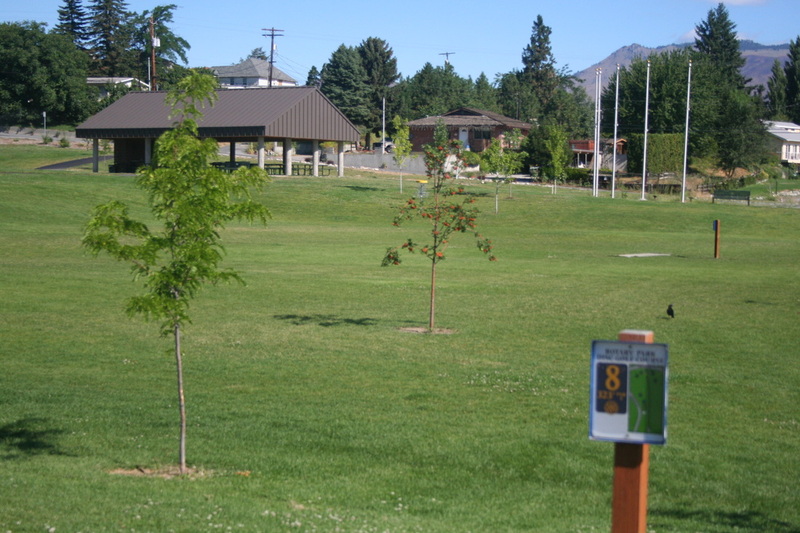 It has become Wenatchee's most popular city park, in a city noted for its city parks. The park reclaimed an orchard property that had been cleared and used as a site for dumping mounds of excavated spoils. Munson Engineers provided a remediation plan and report for the soils, and conducted testing in conjunction with Washington State Department of Ecology personnel to verify that the remediation had acceptable results. A final remediation report was prepared after construction.